Badenoch and Strathspey was traditionally divided between the Highland region and the Grampian region and stretches from Loch Laggan in the south-west to the beautiful town of Grantown on Spey in the north-east. This area is sometimes referred to as Monarch of the Glen Country, named after the successful BBC series on the so called estate of Glenbogle from which the castle can be found opposite loch Laggan and is called Ardverikie castle. The are has some of the most beautiful mountain landscapes in Scotland. The river Spey and the A9 between Perth and Inverness as well as some beautiful and touristic villages such as Nethy Bridge make up the views in the valley. 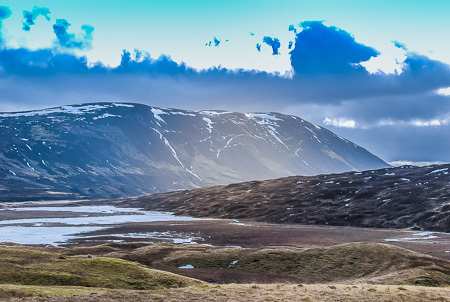 The impressive and mostly uninhabited Monadhliath mountains to the north-west and the huge Grampian mountain range to the east give the area its character and charm. Another well knows attraction is the Strathspey steam railway. 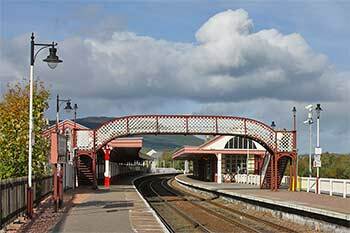 From its base at Aviemore through Boat of Garten and on to Broomhill, the railway takes you on a nostalgic 20 mile round trip along part of the original Highland Railway. As the train passes over Moorland, through woodlands and by great sweeps of the River Spey, the Cairngorm Mountains provide a backcloth to the scenery. Driving north over the A9 from Perth, Dalwhinnie Distillery is a stunning view as it’s located in some amazing mountain scenery. The distillery is the highest one in Scotland at 355 metres above sea level, that’s 1164 feet. The name Dalwhinnie originates from Gaelic and refers to the ancient drovers routes that passed here. The distillery recently won an award for their outstanding tour and you can enjoy one yourself every day of the year. Kingussie is the traditional capital of Badenoch, the area of the upper Spey Valley in the heart of the Scottish Highlands. It was founded in the late 18th Century by the Duke of Gordon and at that time it was a small hamlet surrounded by a vast pine forest. On the opposite side of the River Spey is Ruthven Barracks, the site of an earlier settlement with connections to the 1715 and 1745 Jacobite risings. Grantown on Spey, a beautiful and traditional Scottish town, is the capital of Strathspey and the perfect base to discover the Highlands. The town is within easy driving distance of Inverness, the Cairngorms, the Speyside and malt Whisky trail. Grantown on Spey managed to remain a lovely quiet town, very much different from Aviemore which can be quite busy. Other highlights in the area are Carrbrdige, known from its ancient packhorse bridge – the oldest stone bridge in the Highlands built in 1717. 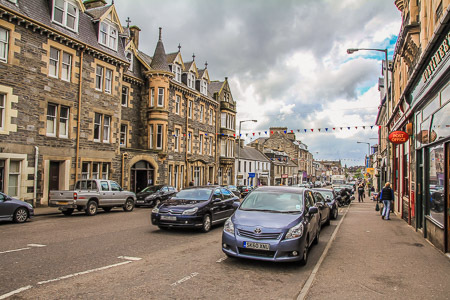 Newtonmore is a traditional and attractive highland village which is welcoming and friendly, offers many facilities, and, although further south as Grantown on Spey, can be just as good a base to discover this part of the Highlands. The video below gives a good impression of the beauty of the Cairngorms and has some great music to go.